CROWD PLEASER: "For me ambition means using my talent to inspire and empower," says the actor, in a scene (above) from Ded Leff. As far as multi-talented Jamaican singer-actors go, Rudolph 'Rudy' Tomlinson is fast establishing himself as a force to be reckoned with ― a versatile performer who can move quite easily between rocking the stage with impeccable vocal dynamics at a Redbones concert to thrilling theatregoers in stage plays like this season's hit musical drama-comedy Ded Leff (from Ashé), in which he gives a memorable star turn as an aging rural father whose difficult son re-enters his life after years abroad. TALLAWAH dropped in on the 26-year-old stage vet (Dreamgirls, Moses, Ah Soh It Go) to hear about life as a modern leading man, the early exposure to the arts that changed his life, and his game plan for the future. TALLAWAH: You've banked stage time with Father HoLung & Friends, the JMTC, Robin Baston and Ashé, among other troupes. What's it usually like working with a big ensemble cast? Tomlinson: It's a very good experience because before I joined Ashe I learnt a lot from doing shoes with Father HoLung and JMTC. Now I am able to pass on my knowledge and use my experience to teach the younger castmates and help them grow as well. We're learning while growing, and it's a fun cast. We live like sisters and brothers. We're a family. TALLAWAH: Indeed. Ashe has come a long way since the days of wonder kids Rovleta, Roslyn and Keisha. What do you make of the group's evolutionary curve? Tomlinson: I think the company has evolved tremendously, and that's mainly because of the work that we put in. [Ashé] is now at a level where we can own our own theatre. Certain standards have been set, and it's now for us to follow those standards and go beyond. They set the mark; now we have to carry on the legacy. 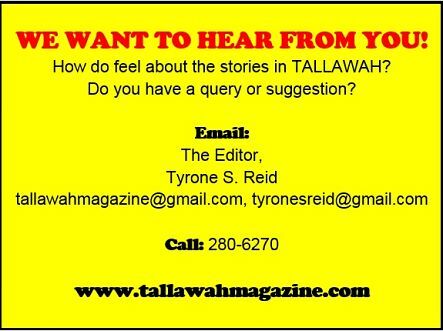 TALLAWAH: You're a Papine High old boy. How did life up there prepare you for the artistic journey you're on now? Tomlinson: It's funny because I was actually thinking about that the other day. I did lot of JCDC festivals in high school, and that's where I got my first opportunity to expose my talent to Jamaica. When I was 13, I got to work with Father HoLung for the first time. We did Amazing Grace, [in which] I played a character named Half Pint. It was my first time playing a lead role. And that's basically how I got started. TALLAWAH: In Ded Leff you portray Desmond, a father who experiences a kind of 'prodigal son' moment when Jonathan shows up out of the blue. Could you relate to your character's roller-coaster of emotions? Tomlinson: It was a real challenge, but one that I enjoyed. To get the character I knew I had to do some research. You know, think of my own father and what he is like as a father. Desmond is filled with regret over not having had a proper relationship with his son. It wasn't a situation I could relate to from any personal experience, but it wasn't hard to imagine when I was creating the character. TALLAWAH: In addition to being a vocalist and an Edna Manley College undergrad [Music - Voice] you're a budding thespian. How will the Rudy Tomlinson story unfold from here on? Tomlinson: I definitely want a successful solo career in music. I also see myself doing musical theatre on Broadway. I'm going to get there some day. For me ambition means using my talent to inspire and empower. I can use my gifts to do a vast amount of things, and I want others to see that they can do the same. I've been exposed to many different genres of performance, and I want to keep going. TALLAWAH: What would you say is the most life-changing thing that's ever happened to you? Tomlinson: Seeing how much my talent has touched other people. People will come up to me after the show and say how much my performance in the production opened their eyes to certain things. That means a lot to me as a young performer who is still learning and growing ― and it propels me to keep going.